Tiki lights are outdoor torches that add a special ambience to any outdoor party. They can be placed anywhere and light up pathways, steps, dark corners or party areas. You can choose from many styles whether you are wanting a more luaua party atmosphere using bamboo tiki torches or a more classic look with metal torches. Outdoor torches can be placed anywhere. We love how they provide not only light but atmosphere as well. And if you use citronella oil they help to keep the bugs away. Be sure to keep lit torches away from dry vegetation or anything that is flammable like wood or fabric. Never leave a lit torch unattended. The wick should be about 1/2" above the flame guard. If it's too low the flame is barely visible and if it's too high it can be dangerous. A solar torch is the easiest of all yard torches. You place them in the ground in a sunny spot, and they automatically turn on when the sun goes down. Ours are still providing a glow when I get up in the morning. No need for any tiki torch fuel or for filling up the fuel canisters. I love how they just come on every evening and light up the stairway to our pool. 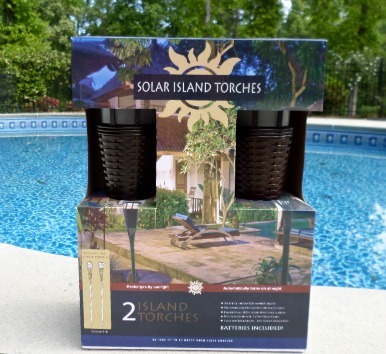 Solar tiki torches provide ambience to any pool or patio area ...without any fuss. No need to go around and light the torches and you don't need to worry if you will run out of citronella oil. These solar tiki torches need to get several hours of sun to come on every evening and to stay on until the wee hours of the morning. Be sure to remove the battery insulator tab when you get them or they won't come on. Because the torches have 3 different tubes - you can make them taller or shorter. It also comes with a stake so you can easily push the torch into the ground. The solar torches by the steps leading to the pool and by the gate to the pool are tall - using all 3 pieces and the ones around the perimeter we used only two of the tubes for a medium height. We have this set of solar torches from Amazon. They have a flickering amber light which makes them look more like a real flame. They are my favorite lights for around the pool. I purchased a second set when I fell in love with how they glow and flicker - placed them all around the perimeter of the pool. I got the dark chocolate colored torches but they also come in a lighter natural color as well. If you buy the set of 4 (rather than set of two) the price is discounted..
Made of polycarbonate - they won't rot like the bamboo torches do after on season. I love how simple they are - no need to light them, you can leave them unattended, they don't use any fuel or wicks, no batteries and ours stay lit until the sun comes up. I wish I had known about these replacement tops that match either the bamboo or dark chocolate torches. We through ours out after several seasons of flickering lights. Our next order will include a couple of these tops to have on hand. No oil, no batteries, no wiring just simply solar which means these flickering solar lights will come on automatically every evening. No turning on or off your lights and no setting timers. 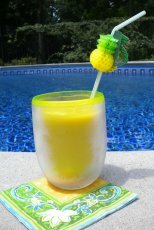 You will love the nice warm, yellow flickering glow these tiki torches provide. Place them around the perimeter of your pool, by the pool gate or on the path to your backyard. Copper tiki torches add a more classy feel to your outdoor party lights. Most of these metal tiki lights are constructed of rust-resistant iron with a brushed copper finish. The copper will naturally patina if it was bought untreated. To maintain the finish, you can seal the torch with lacquer or wax the light when you first get it, and periodically add a coat of sealant. Metal tiki torches serve as a decorative piece in your yard or garden during the day and as an outdoor torch in the evening. Although they are more expensive than bamboo tiki torches, they are more durable and come in a variety of styles, colors and finishes. We love how they provide not only light but atmosphere as well. And if you use citronella oil they help to keep the bugs away. You can keep them outside all summer which means you don't need to put them out and then bring them in after every outdoor party. A copper tiki torch is a very popular choice for metal torches. The can is copper plated under a process to prevent rusting. Make sure your outdoor garden torch comes with a fiberglass wick that will last a lifetime. As you can see from this picture, the torches should include a snuffer/cap attached by a chain. Put the metal cap over the wick to extinguish the flame and to keep rainwater out when not in use. If you plan to entertain in the evening frequently with your guests or with your family, then invest in the metal ones for durability and design. Amazon carries a nice selection of outdoor torches and several styles of copper torches. 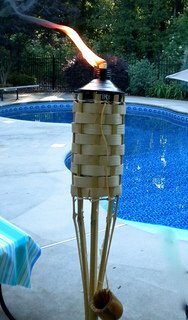 Bamboo tiki torches are an inexpensive way to "light" up your backyard or pool area. These outdoor torches are not just for luau themed parties - they look great for any adult or adult supervised pool party. If you keep your bamboo tiki torches out all summer, they should last about one season and will then have to be replaced the following year. The good news is that there is no need to store them through the winter. Typically these outdoor party lights are 60" high - so if you are buying them on-line be sure to check the height. Bamboo tiki torches are the most affordable way to provide outdoor torch lights for evening entertainment. They are the easiest to find as well. You can find them at any grocery store, Target, Home Depot, K-mart, etc. during the summer months. They run between $3-$5 a piece. Be sure to buy several of them (6-12) to get the right effect. 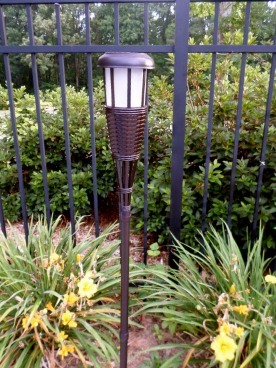 Place your tiki torch lights at the entrance to your pool or yard, along pathways, near steps and eating or sitting areas. Made of woven bamboo and a refillable metal tank holds about four ounces of oil. This amount should burn for approximately four hours. The tiki torch fuel is sold separately. Keep plenty of tiki torch fuel at home so you are always ready for an evening outdoors whether it's alone, with family or adult entertaining. Tiki torch oil can be purchased at any local home improvement store, grocery store or big box store. You may be wondering if there are different kinds of tiki torch fuel and if so what's the difference. Citronella fuel is the most common tiki torch fuel, but there are some brands which are better than others. Citronella has a pleasant smell and helps to keep away mosquitoes and other small bugs. Tiki torches can serve two purposes - as light and as a mosquito repellent. One of the most effective mosquito chasing oils is Citrascent. 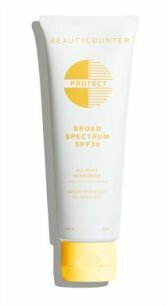 This one is not found in our local stores so I buy it from Amazon. It is more expensive, but we spend less money on buying mosquito sprays and other insect repellants. It also burns slower which means it lasts longer than other cheaper brands. Getting the tiki torch fuel into the torches without spilling is difficult with a full bottle. I will pour the oil into a smaller container first and then pour it into the torch. Or you can use a small plastic funnel to pour the oil into the canisters. Be sure to pour it SLOWLY so you don't overfill and spill the oil which is messy and can stain decks and clothes. How often does your canister need to be refilled? It depends on how big your canister is and how many hours you burn your tiki torch. We can usually light our torches a couple of times before having to refill them. Checking and filling the canisters should be on your party check list to make sure you have plenty of light for your evening pool party. Mosquitoes anyone? You have a beautiful evening planned, the weather is finally warm, a slight breeze, no rain in the forecast, - a perfect evening for an outdoor gathering. Mosquitoes, gnats, no-seeums can wreck any outdoor party. These unwelcomed guests can turn a perfectly planned evening into an annoyance. Tiki torches using pleasant smelling citronella is one way to help keep the bugs away. 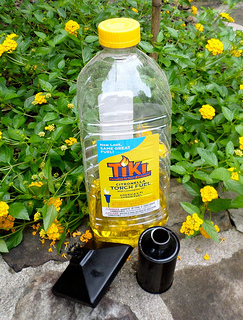 Smokeless and Odorless Oil Tiki torch oil comes in several different varieties - from citronella oil to chaise away mosquitoes to smokeless and odorless oil that burns nice and clean. This oil made by Lamplighters is for those people who are bothered by the smoke and smell of traditional oil. Or if you are going to use a tabletop tiki torch or place torches near the food, then you want an oil that will not produce smoke or offensive odors. This paraffin oil costs more than other tiki torch oils, but it burns clean and indeed is smokeless and odorless. Don't let the lights go out on your party because you don't have any tiki torch wicks. The wicks need to be replaced periodically, especially the cotton ones. It's a good idea to keep some on hand, as it is not always easy to find these at the store - especially since they are a seasonal item. Sometimes you will see tiki torch lights that cost more than others even though they are an almost identical product. Usually it's because they come with fiberglass torch wicks rather than the cotton wicks. The height of your flame is determined by the size of the wick coming out of the canister - the more wick the higher the flame. Sometimes it takes a little adjusting - the flame may be too high or too little. Blow out the flame, let the wick cool and then either pull out more wick for a higher flame or push down the wick for a smaller flame. Cotton torch wicks are very inexpensive. 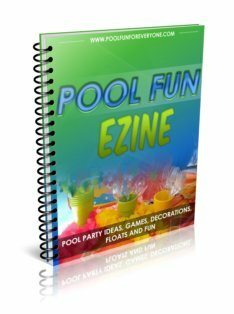 It's a good idea to have a package or two on hand so that you're prepared for your next evening out by the pool or backyard. They are not easy to find in the stores. The inexpensive cotton wicks do not last a long time - but they don't cost much to replace them either.
. 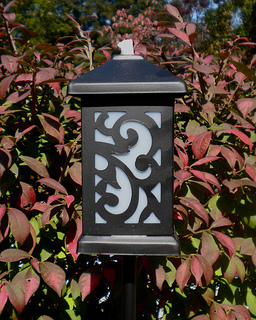 If you use your tiki torches frequently, the fiberglass option would be a smart buy. The cotton ones cost about $2 a piece. The fiberglass wicks cost about $7 a piece.